LATEST – THE END IS NEAR The latest of a series of increasingly worried – but more realistic – reports seems that the great myth about Sai Baba living into his 90s, as he has predicted – so he “I can finish My Task” is about to be blown apart. EARLIER UP-DATE 15 April, 2011: The patient’s condition remains critical – he cannot eat and is on heavy medication to maintain his vital parameters. The import of this condition with multiple organ failures after (now) 18 days in the most intensive care possible was hinted at by an earlier announcement that ‘Docs fret over Baba’s sluggish recovery’ (see Deccan Herald:- http://www.deccanherald.com/content/153058/docs-fret-over-babas-sluggish.html) where his minders admit his slight improvement as being “not satisfactory”. He was also found to have liver damage and jaundice. See latest blog on his condition here. 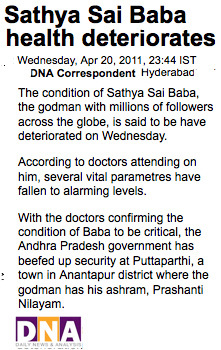 Reports from 7th April stated that there is no change in Sathya Sai Baba’s condition from the day before. In short, stable – but not without the respirator and the k idney dialysis. That Indian government officials – and even Sathya Sai officials – are so concerned about the succession question and what will become of the huge assets controlled by the Sathya Sai Central Trust rather indicates that they are cynical as to the chances of Sai Baba’s recovery. Large numbers of devotees evidently believe that the illness is only a test of themselves and their faith designed by an all-powerful Godhead and/or that he is taking on the cosmic karma of humanity and similar ideas which he has been inculcating in them for many decades. Various close observers and investigators through the decades have considered him some kind of ‘split personality’ regard him as a normal human being on the one hand – a coarse and ignorant villager – who is however often the instrument of unknown forces that they believe exist and intervene in human affairs through mediums, channels and persons of unusual psychic and intuitive abilities. (striking comparisons have been drawn between his behaviour and the famous and powerful monk, Rasputin). Scans of parts of two news outlets give a glimpse of the turmoil created by the apparent demise of Sathya Sai Baba long before he reaches the age of 92/93 or 96, when he has various (and contradictorily) predicted he will “leave the body”. If he dies soon and under the conditions which now beset him, it will be a far cry from the alleged yogic control of reaching ‘mahasamadhi’ or moksha of paramahamsas such as Yogananda or saints like Shirdi Sai Baba did (whose identity Sathya annexed in his early days… a very different figure with quite different and mainly Islamic teachings). A veteran of the Sai Exposé from it’s earliest days, Hari Sampath, has provided this report and his own reflections on Sai Baba’s current situation: It is reposted here, showing as it does his foresight in the matter (08 August 2007). One may or may not agree with the views below, but many do – many more than is generally realised, as is shown by the number and quality of prominent devotees and office-bearers who have resigned from the Sathya Sai Organization, and not least by the over 1500 persons who have signed a petition for Sathya Sai Baba to be brought to justice (which can never happen in India where his money and influence have so far been decisive in blocking all court petitions). Sathya Sai Baba’s extremely negative karma accumulated for long has been slowly catching up with him and approaching fruition. The countless victims of this fraud, victims of false promises, sexual abuse, cheating, deception and every known act of Adharma had been put to physical , mental, emotional and spiritual misery for a lifetime, and the combined effect of these people’s misery is certainly recoiling back on the colossal fraud Sai Baba. Most people will remember that in the early days in the 1940’s an old saintly man was brought to sb by his disciples. This man was considered a Guru locally, and had 2 stumps for his legs and was carried around by his disciples. Sai Baba publicly scolded him for that and instead of expressing even basic human sympathy, chided him for being a burden on his disciples by being dependent on them to be carried around. Now the wheel has come a full cycle and the poor, accursed wretched soul Sai Baba himself is being carried, wheeled around, and dependent on his personal staff for even performing basic physical functions. So many thousands of people , promised “divine cures” and stuck to wheelchairs etc , having been cheated by this fraud and even abandoning conventional medical treatment for disabilities like Dorothy/Pink Twins among many others, people without physical vision, hearing, paralysis, mental ill health, and so many other types of physical disabilites, had been cheated deliberately by this false messiah of deception, and Sai Baba’s karma has caught up. Now he is reduced to a gibbering, senile, drooling, old fool, in a pathetic condition in full view of the world. He is dependent on his staff even for eating food, going to the toilet etc, what a cruel fate he has invited upon himself. His situation is so pathetic that he has asked his devotees to pray for him and also conduct healing yagnas etc. The hand that promised to lift a “range of mountains” can’t even cut a cake now or wear his dress properly when it slips ! The feet that promised to walk across the skies is unable to even hobble across the hall for a few feet ! While I do feel somewhat sorry for this pathetic condition, I also realise he has inflicted many many times more on innocent sincere seekers of God, who trusted him and were promised solace from all problems, only to be cruelly cheated for the most selfish of reasons by Sai Baba. At least God has been kind in dealing with Sai Baba in that there are people to attend to him and he has material comforts, but then these folks are also doing so so that they may share the loot gathered over years and for their own selfish ends. Its got to a point that even the SSO officials and gangsters are sick of waiting on him hand and foot, and apart from the outward civil behavior in public, I know that in private they are quite rude to Sai Baba knowing he is an exhausted incapable senile old man, and also he had been putting many of these officials through his spiritual/divine bullying for years, now they are happy to get back at him. I believe these personal staff sometimes don’t even respond promptly to Sai Baba asking to go to the toilet, resulting in even bed wetting at times. How terrible and sad. Just like an old, aged senile relative being barely tolerated because of his bank balance and hopes of being remembered in the will and legacy. These people are just hoping Sai Baba dies soon, but I don’t think he will die soon, because afterall the god of death is Dharmaraja or Yama, who himself wouldn’t want to come anywhere near sb soon to put him out of his misery, such an extreme case of adharma is Sai Baba. I in fact feel that Sai Baba’s misery has just started and after losing his legs and one hand, soon he will lose his hearing, speech, eyesight and mental sanity, one by one, and his misery will be shown to the whole world, and he will be exposed for what he truly is : the retribution for a lifetime of massive fraud, debauchery, trickery and self seeking, for name and fame as God, resulting in an old age drooling, gibbering, legless, blind, speechless, paralysed and broken, and humiliated old wretch. His life will indeed be a message to humankind. And it will end only when God finally acts mercifully to put him out of his misery. It was not said lightly that “he whom the Gods want to destroy, they make him mad first”, and we would see this too.